The Rautes around one of the many fireplaces in the camp. 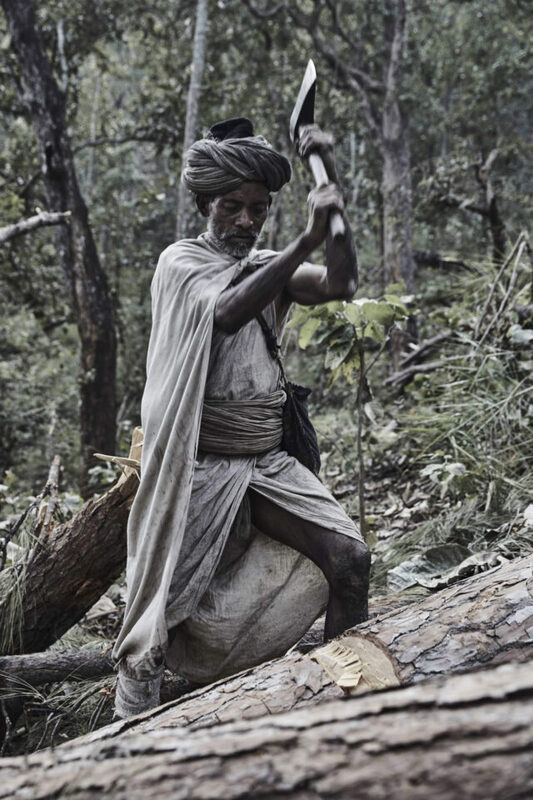 No one is handling wood and fire as the Rautes, who call themselves the Kings of Forests. The Rautes continue to maintain a certain degree of secrecy and avoidance towards assimilation, in order to keep their identity and to survive as a distinct community. As a photographer and an outsider, it was at first not that easy to deal with the Rautes. It took some days before they understood and accepted me in and around their camp in the forest. First, we had to get the acceptance from the Chief Headman and three other headmen, as well as from the community. Then we could start to hang around and photograph. Mother and child at the fireplace during the evening. Several times, the Chief Headman came to the nearby bazaar, where we were staying, for negotiating and making sure that he and the community also benefited from my visit. One of the first days, we had a nice interaction with the Chief Headman and his wife talking about the origin of the Rautes and listening to their stories. We also showed them a book about the Rautes, and it turned out that the person shown on the front page of the book was the father of the Chief Headman’s wife. They were very pleased and happy, and we continued watching a documentary about the Rautes on a laptop. They of course knew all the people in the documentary film. Today, the community counts only 156 people. A family at home. The Rautes migrate through the remote forests of Western Nepal and are living in tents. Kapil who is lying at the back as got serious burns and is slowly recovering. At some point, the Chief Headman wanted me to buy him and his wife a large rooster. He could not convince me, and we had a bit of crisis later that day. But a few days later, it all worked out very nicely and they got their rooster. Another day, I was taken strongly by the arm and escorted out of the camp. We had not delivered the last goat, as agreed, and we were taken through the forest to the nearby village for goat negotiations. We found a goat at a reasonable price and returned to the camp to continue the photography work. A young Raute woman cutting trees. The Rautes make a few different types of wooden products, which they trade in nearly villages and bazaars. A father with his children a chilly morning in the forest. Women grinding corn in the forest camp. It took me three days from the capital Kathmandu to reach the camp of the Rautes in Accham in Western Nepal. When doing such photography, it is very important to stay flexible and willing to spend the necessary time. It is very difficult to plan in great detail beforehand. Expect the unexpected. The uncertainly is what makes it so fascinating. It also all depends on the people you meet. My great advantage was that I know Nepal well and speak the main language Nepali. It meant that I could communicate with the local people and also with some of the Rautes. I had also teamed up with two local journalists, who knew the Rautes well and with a social worker from the area. Local contacts are essential and necessary for such kind of photography. The Chief Headman of the Rautes with his Rautes fellows. I knew that access to electricity would be a problem. I was, however, lucky that we did have access to some solar recharging during some of the days. If you are out in remote areas, you have to think carefully about your battery capacity and possibilities of recharging cameras, laptop, etc. Make sure you have plenty of batteries, reliable storage and solar recharging. 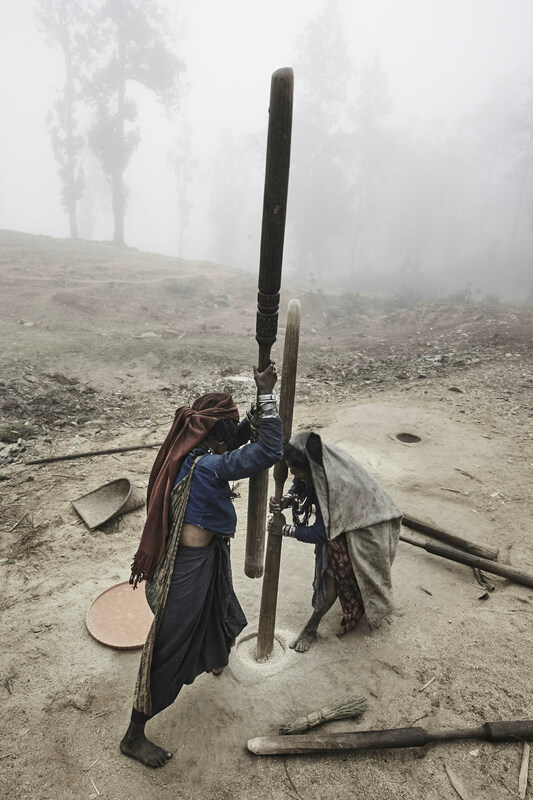 A rautes cutting trees near the camp located in a remote place in the district of Accham in Western Nepal. A Raute boy an early morning in the camp. Photography is very often about meeting people. In such cases, it is essential to use your empathy and listen to people. Without good interpersonal connections, it would have been extremely difficult to get good portraits. 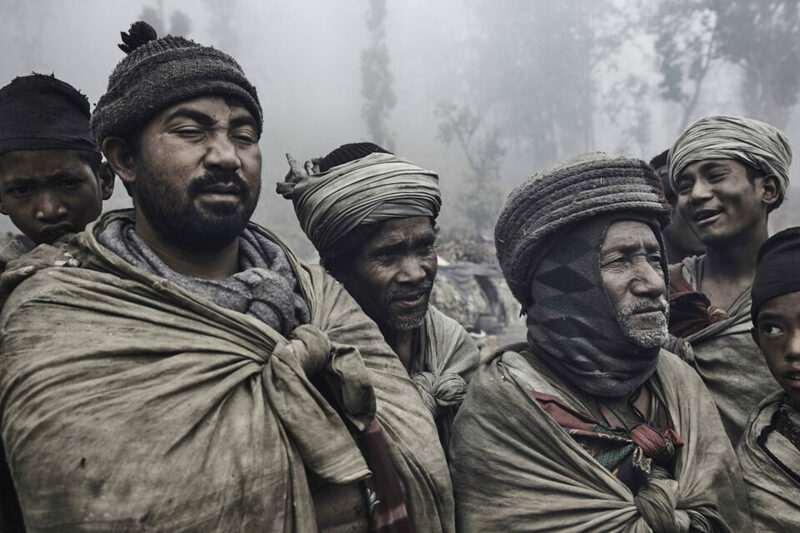 If you decide to photograph remote areas and people like this, it would be very beneficial to do some research beforehand about the people you are going to meet. This will help you when looking for motives, composing your images and develop the story you want to tell. Finally, always be on a lookout for not just portraits, but also environmental shots and details. Such opportunities are everywhere! 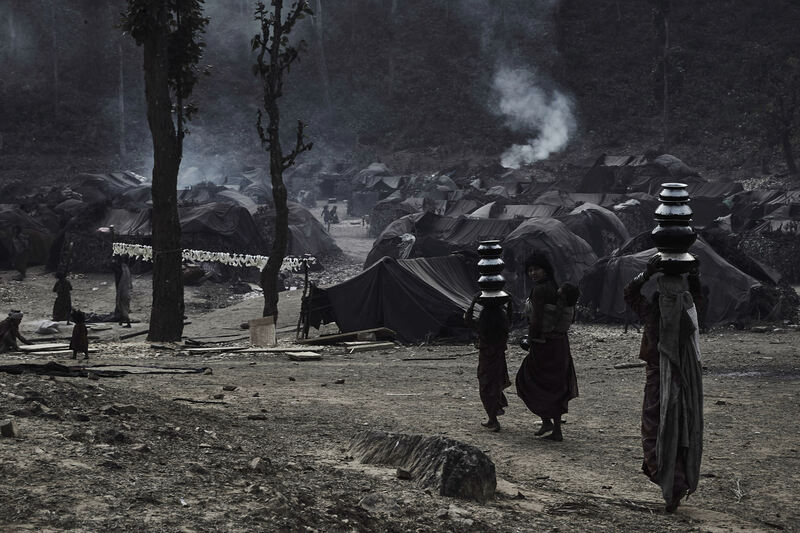 Raute women carrying water to the camp. 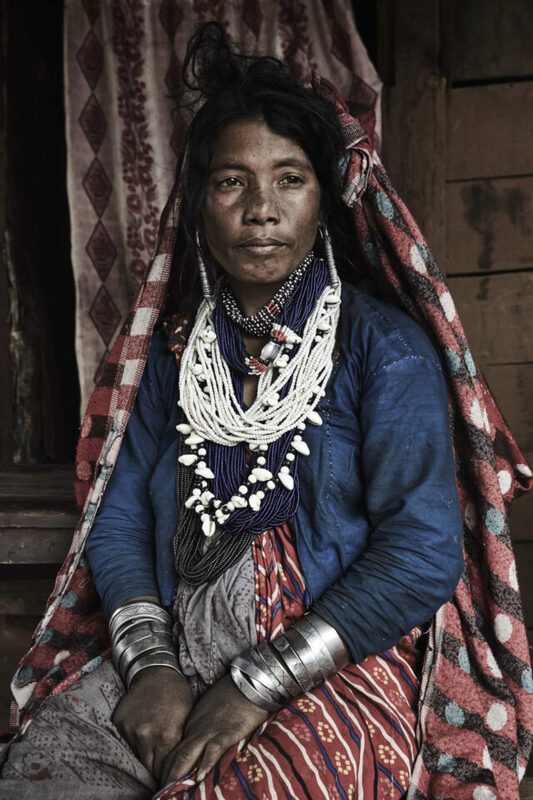 A Raute woman in the nearby bazaar close to the camp in Accham of Western Nepal. 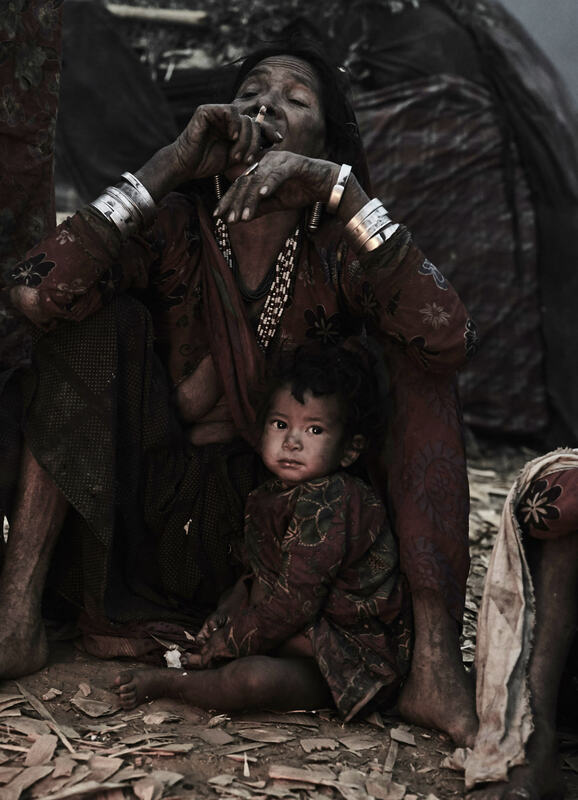 I hope you have enjoyed my story about the nomadic Rautes, along with the images presented in this short article. This article was submitted by Jan Møller Hansen. Please visit Jan’s online gallery to see more of his work. 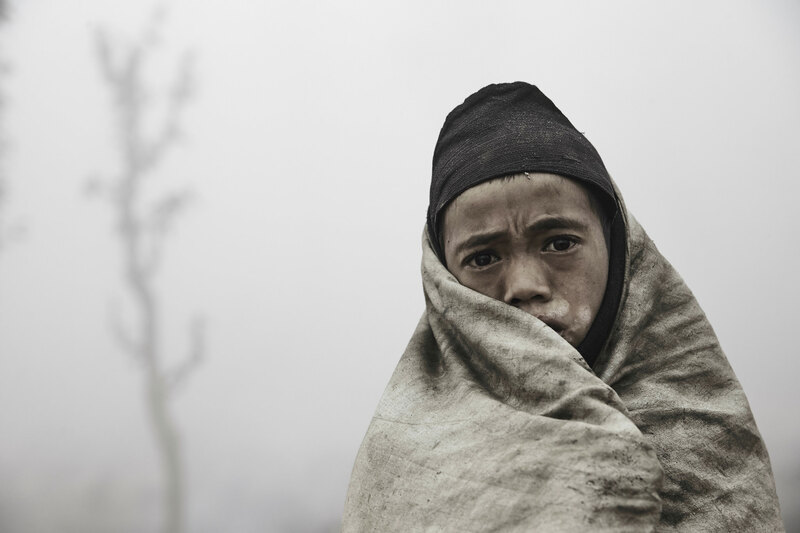 These images are an utterly extraordinary window into a people of whom I had no knowledge. Thank you so much. Wonderful pictures and truly appreciate the trouble you took to be accepted by these people…must have been quite an experience. Thanks for sharing! Extraordinary! 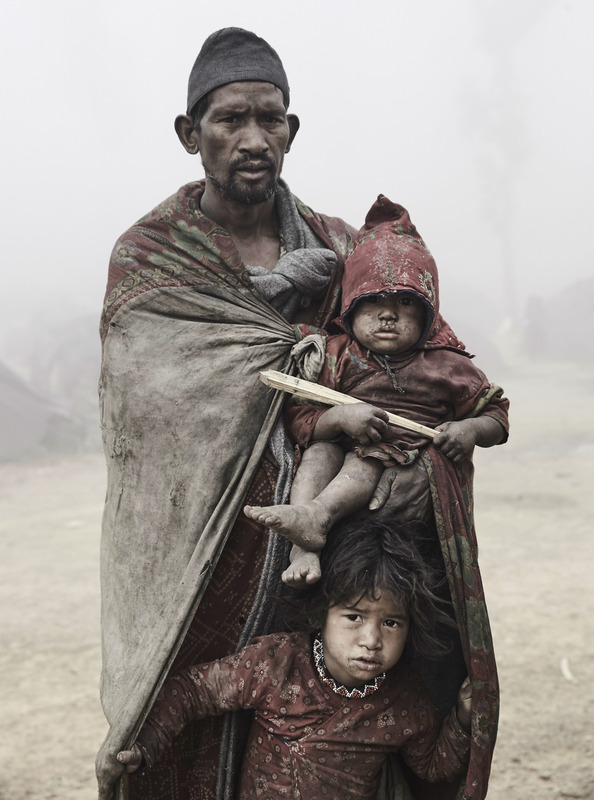 I have taken a lot of pictures of tribal peoples in China, but yours is at a different realm. Thanks for sharing. Thank you so much for bringing out such a beautiful story and amazing pictures..! Despite being originally from Nepal, I have not seen so many well composed and excellent photos you have presented here. We used to read about these people in our social studies at school and later occasional low res photos of some Raute head in newspaper. Thank you for this post. I am sharing it now. It is a beautiful work, however, in my opinion, overexpose editing images added no mystery in the concept, in addition to the feeling that something is wrong. You could have kept the correct exposure and only attenuated colors. However, is only a particular opinion. These pictures are absolute fantastic and the story is very interesting, thank you very much! I have a question though, would you classify your article as photo reportage or something artistic? The pictures are all rather dark / grey / muted, almost no smile, no sun, no blue sky, is that your view or is this region really that depressing? Was your post processing aim to give a rather dark / artistic view (color desaturation) or did you see the people and landscape like that? Dear Daniel, I usually photograph early morning or late afternoon. It was winter and it is very foggy in the forests during this time. That’s why you get this sense of the images. I like that. Most images are taken at low light. brighter times, sun and blue sky too? And maybe some laughs or smiles? As many others here, I have never heard of the Rautes, according to your pictures, they are gloomy and secretive, living in dark and foggy places. Daniel, they are not representative of the region in the sense that there are only 156 persons left. But they are aborigines from ancient times, and they have develop synergies within the Hindu culture of the region. 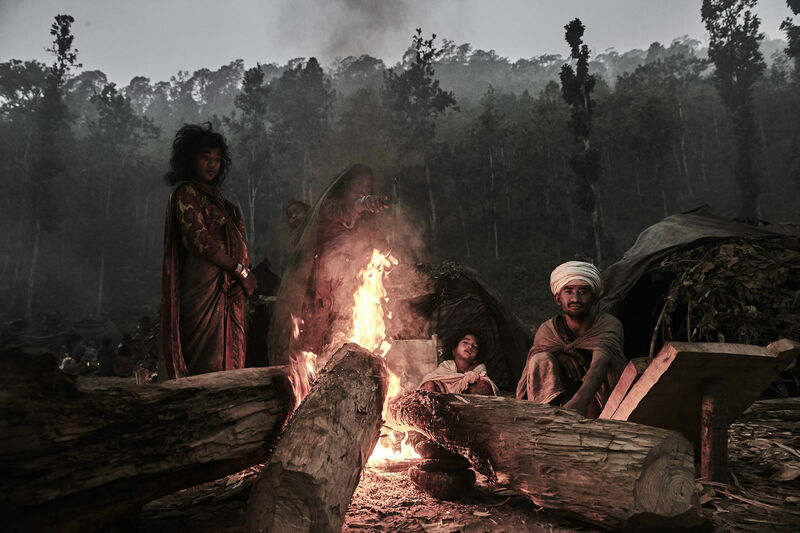 They live on their own, but do trade with nearby villages around their camps in the forest. Looking at these photographs was like looking at a very old copy of National Geographic magazine, when explorers took a cameraman with them, dragging a load of equipment that required a pack mule. And the article was published with a title something like ‘Our Man in Tibet’. It’s nice to know that not every single corner of the world has been turned into something ‘modern’. I hope it stays that way, and that the Rautes tribe maintains their autonomy. I’d like to know more about them. I hope this brief article is a small part of something else. I enjoyed it very much. Thank you, Sara, for this interesting comment. I might not be finished with the work……I don’t know yet. Great article and great photographs. Thank you! Thanks, for letting us learn about them. 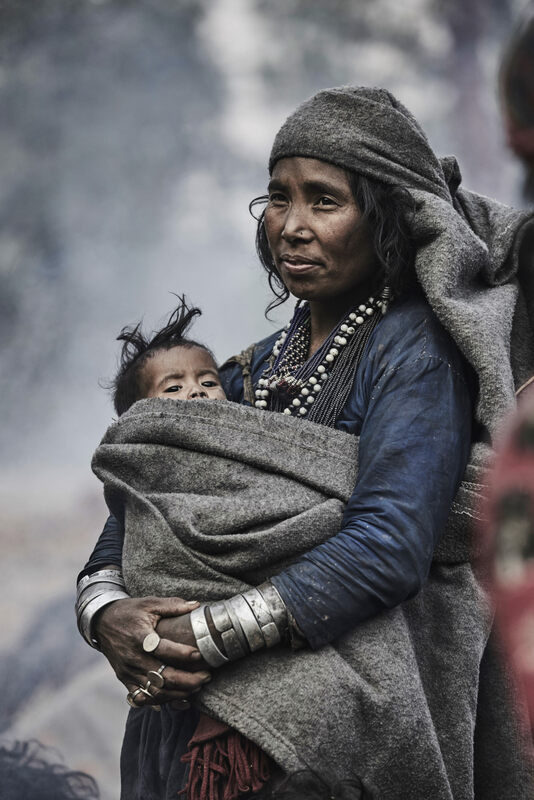 The pictures are wonderful particularly the second one with the women having her young child in her arms. What also amazed me is the fact they seem to be bare foot in low temperature season. 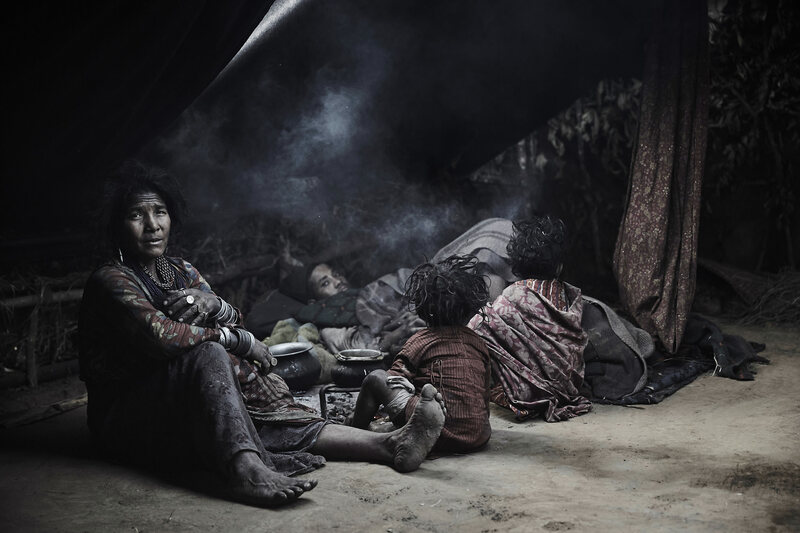 Stunning photographs and narrative . . . Bravo! Outstanding photos. What programs were used for post processing, and what effects? I use Capture One Pro 9, DJ – but only do a bit of editing. I am not very good at photoshopping, but is more interested in the motive, composition and story behind the image. It was the first time that I tried my new Sony ILCE 7R Mark II, but I also brought the Canon EOS 1DX – two cameras that supplement each other very well. I love the story and photographs! Excellent work. Thank you for sharing. Great story and images. First class ! I love the photos and the story, but not really a fan of the processing. It gives them all a very strong ”look” which they are easily good enough to do without, and its obvious enough that its taking my mind out of the photos and the story and into the processing which is a shame. There’s a few where sharpening halos are creeping in, and the equivalent of what would be the clarity slider in lightroom/camera raw is a touch heavy in some of the backgrounds. I think they would be improved by taking the processing down by 50-70%. I also think they are an excellent set and had great pleasure reading the article. Thank you, Richard. Much appreciated. excellent photos! Thanks a lot!!! !